Ever wanted to harness the power of magic to survive? Now you can! 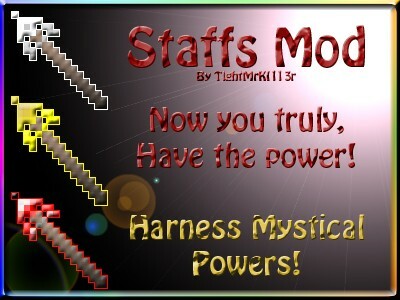 These magical staffs each have 16 uses, and each have a different power. Strike your enemies with this blast of power! Harness the power to cause explosions... at your fingertips! Launch many arrows into the air, raining death on your foes! Get a human to join you in battle for 30 seconds! Get a wolf to join you in battle for 30 seconds! Teleport up to 4 blocks forward/up! Arrow barrage needs to be refined, It will eventually have a 'porcupine' effect(Arrows shoot in all directions)! Add an enchantment system to make the staffs more powerful/last longer! Add porcupine effect to arrow barrage! You have to right click a block for the effect to work. Step 1) Go to %appdata%Roaming.minecraftbin. Step 2) Open 'minecraft.jar' with an archiving program. Step 4) Delete the 'META-INF' folder. Step 5) Create a folder in '.minecraft' called 'mods'. Step 6) Put the 'MagicStaffs.zip' into this mods folder. First off, try to reproduce a problem, if it doesnt work first time, try again. If you get the error continuously, go into your '.minecraft' folder and open 'ModLoader.txt'. Copy and paste the contents of 'ModLoader.txt' in a new pastebin (Click Here). Post the link to the paste in the comments. Be patient. I will respond assuming you have done as I have asked. - Did you delete META-INF ? -- Yes: What other mods do you have installed? I have the power *insert strollin' meme here* Awww Right. But seriously I think the massive chain of updates has passed and it's 'safe' without breaking it again. That's a good idea :D. I haven't tried most of those, so ill have a look at some of them when they're updated. The 'zombie apocalypse' mod sounds good. What is it? My first piece of work with a good buddy Zexanima! That's a definite download from me if you do revive it! a dimond from me! Super awesome mod. can you please put a ModLoader link in description??? is it for 1.2.3 cause it don't work? This mod is fantastic! 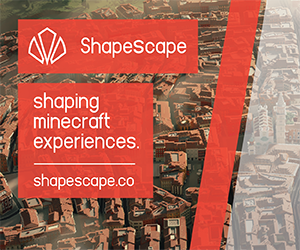 Can you make it for the 1.2.3 minecraft version? It would be great! :D Thank you! Thank you very very much! This is awesome only wished u could point the wand and strike without looking and a ground or wall. u deserve a diamond! I may make it like that at some point. EDIT: I didn't know you were a mod now!!!! HELPFUL SUGGESTION: Instead of just doing porcupine effect, set it as a charge attack, I dunno, if you hold down right-click, a bit like using a bow how it does more damage. Something like that. anytime I install it it just does nothing, I put it in the mods folder but when I start minecraft, nothing. help plz? Is there a 1.0 version because Its amazing but I wanted to keep my other mods also. this is how i know, when we find out some more coders, and we finally get onto steady updates, sweet dreams is gonna be the best mod on pmc. I know, I know, but, that won't be hard! then all of us can carry on with this! I got this mod by the way, and it's really really really awesome! add more staffs, it's too fun to use! I use TMI, so when i Shift-click on them...to they go 111 or do they normaly have unlimited uses like a golden pickaxe. each staff has 16 uses, but I will add an enchantment system to make them better.